Life is full of love, likes and expectations as nicely as it is full of clashes, conflicts and mistakes. We fall into all these, even if we know it is an illusion and these are meant to let go. Especially in relationships, we ride on a plane of uncontrollable emotions which take us from extreme of joy to extreme of sorrow. Those who make up easily and intentionally, keep on the ride. While those who fail to manage, stay back until they start another ride of the same kind. But what if we meet the companions of an old ride after we have moved on to new paths. Sometimes two close friends have serious clashes and call an end to their intimacy, understanding and affection. I often see people giving stranger looks to each other after they meet each other despite of the fact that they have shared unforgettable pleasure and pains together just sometime back their lives. Does this mean they have moved on? No. This means they still remember all that which is why they are not able to give each other a perfectly stranger’s treatment. If you break up, do it carefully. It is important to forgive, if certainly not possible to completely forget, before you move on. And the best way to forgive each other is to believe that ‘it was no one’s mistake’. There is enough possibility that both of you are right at your own points. This is just that you both have different points of view, you should not call the other person wrong. Even strangers have a defined relation which is of being stranger to each other. So why should we not have a pure heart towards our companions with whom we have broken-up some time back. You may be right at your point and the other person’s view might be absolutely ignorable, but proving the other person’s fault would certainly not heal any of you. On the other hand, if you let go and make up again there is nothing more cheery for both of you. So, next time your ego asks you how to let go, how to forgive or how to make up again, tell her that it was probably no one’s mistake. Its human tendency to love and care about everyone we live with even if it is a pet of ours. Letting go means you are erasing the mistakes of past from your picture of life even if those were jotted by someone else. afterall life needs to be beautiful.. only beautiful. I liked the Post. YEst its good to Let Go. atleast for the sake of Mental peace. But, Sometimes not possible in some situations. I guess you should give a more heartfilled effort to this in situations when you think its hardly possible. The point is, you move on with no unnecessary burden of past failures, no matter whether you sort out things and settle back or not. Its high time we realize this. Feels so plesant to read this. Absolutely high time dear. The irony is unless we do it, we don't realize how really important and pleasing it is. Thank you dear. I wrote this because I have adopted this in my life and it really pays off. It might have been preached to you several times before also but trust me if you start doing this, you would also start telling others the same. I always have believed that people dont change, situations and environments do. This is the reason why people drift apart. One should try and remember the happy times and bear no hatred or ill will. its great you practice such a nice thought in your own special way. Harbouring ill feelings are only going to hurt us. Forgiving and moving on is definitely the better option, though harder. carrying on the burden of complaints, arguments and sorrows is also difficult. Letting go is the option where hardwork really pays. I agree..its important to let go SHipra but its easier said than done. Sometimes its just not ego but the broken trust that comes in between. 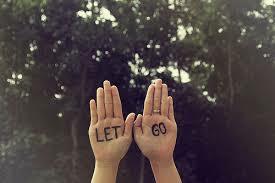 But, yes if we let go it makes us happy and peaceful. I have crafted this thought dear. The thing that needs to be done is our own detoxification. It is only done with forgetting and forgiving. Forgiving isn't important, for me closure is essential! yes. alteast when have to move on you cannot carry the burden of past clashes.